I didn't have much stuff in the fridge so I had to be a bit creative. It didn't turn out too bad in the end. 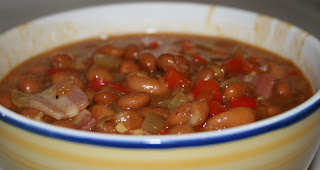 You can add more ingredients if you want, peppers etc, but it works quite nicely with just a few ingredients like this. Season the steak. Quickly brown the steak in a frying pan, put to the side. Cook the onion on a low heat until it starts turning golden brown. Add chutney to taste and let it heat up. Raise the heat and put the steak in with the rest and make sure it's all heated through. 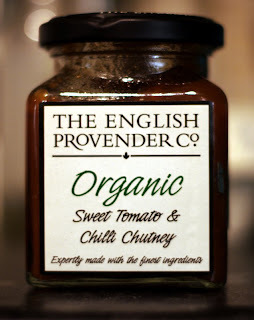 A great Sweet Tomato & Chilli Chutney from The English Provender Co.
Not baked but me, but I sure enjoyed them. Many thanks to the baker! ;) If you want to try them yourself, have a look below. The recipe was freestyled a bit by exchanging the almond essence with vanilla and adding lime as well as lemon on the top. 1. Preheat the oven to 180C/fan 160C/gas 5. Prepare the decoration: cut the yellow part of one lemon into thin stripes, and let them simmer in a pan with 200g water and 200g sugar for about 20 minutes. 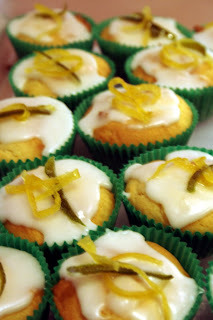 Let the lemon stripes cool in the syrup while you prepare the cupcakes. 2. Prepare the dough: beat the eggs with the sugar for 2 or 3 minutes. Add,still beating, the butter, the ricotta, lemon juice and zest, the almond extract and, at the end, the flour previously sifted with the baking powder. The dough should be smooth and silky. 3. Pour the dough into 12 muffin tins lined with paper cases (they should be filled at 3/4 of their height), and bake the cupcakes for 20-25 minutes in the oven untill golden. Allow to cool on a rack. 4. Prepare the lemon glaze adding about the juice of half a lemon (you can use the one you zested for the decoration), and mix untill you get a very dense glaze. 5. Pour one or two tbsp glaze over each cold muffin, add a few lemon stripes on top and let rest for 10-15 minutes before serving. I was late home today and low on inspiration, ingredients and money. What I did was that I took some tortillas and made some kind of pizza of them. 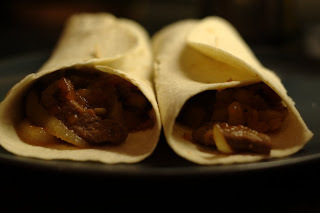 Take one tortilla, spread it with tomato sauce, barbecue sauce or whatever you feel like. Top it with cheese, onion, chorizo, garlic, chilies or whatever you have/feel like. Then repeat until you have enough layers to make you feel satisfied. 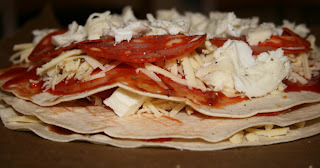 Chuck the layered tortillas into a nice and hot oven until the cheese has melted and has a nice color. All layers prepared and ready to get cosy in the oven. 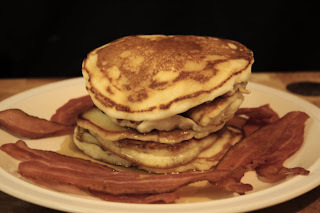 I found the recipe for this in the Diner cookbook. I did some adaption, namely adding the chilis. No heat - no love as I say. You can choose to leave them out if you want less heat. Normally you'd serve this as a side to pulled pork for example but it works nice on its own. Preheat the oven to 160c, 325f, gas mark 3, In a heavy, ovenproof casserole, heat the oil. Add the garlic, onion, red pepper, chilies and season. Fry for 5 minutes. Add the barbecue sauce, water, mustard, vinegar, beans and maple syrup. Mix together thoroghly and lay the bacon on top of everything. Bake in the oven for 45 minutes, or for longer if you wish the bacon to be a bit crispier. Once done, let it rest for 5 minutes and then break up the bacon into smaller pieces and serve. 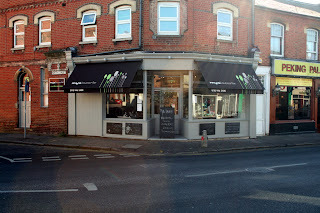 A little while ago a friend of mine made me aware of a new restaurant, Mya Lacarte, in Caversham. My friend sent me the link to their website and I had a read. I'm sorry to say this but I must admit that my initial impression was that of just another restaurant/pub that wanted to jump onto the gastro pub bandwagon with local this and British that served with fresh thisthat. I want to take this opportunity to apologize for jumping the gun. Today was the day we decided to try them out. For starter I choose the Wellbarn Farm venison carpaccio, pea shoot salad with Spenwood shavings. I must put myself on the back for that selection. The venison was divine, the taste of game was very evident and the shavings of Spenwood had a very strong taste that accompanied the carpaccio really well. My choice of starter was from the Winter menu. My friend selected vegetable soup with freshly baked bread from the daily special menu. I did not get to taste the vegetable soup, it was too good to share I think, but I managed to try a bit of the bread. It was still nice and warm from the oven and had a beautiful caraway seed flavour. Needless to say, there as not a trace left on the plates of our starters. To stick with the theme my companion choose the main from the daily special menu. Since it's Sunday today the choice fell on pork roast. 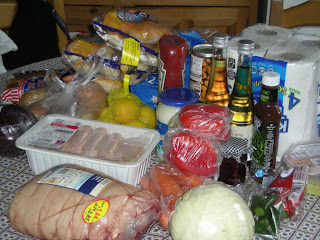 It came with roast potatoes, carrots, broccoli, gravy, cold applesauce and pork crackling. I managed to steal some tasty bits of the potatoes, applesauce and the pork crackling. All of them were awesome, but I must say that the pork crackling was out of this world. My own main meal came off the Winter menu. I had three favorites from the menu from which I managed to select one. My selection fell on the selection of game; partridge, venison, monk jack sausage and rabbit. This was served with chestnuts, creamy cabbage and juniper berry sauce. I also choose to go for the creamy mash from the menu on the side. The meal was sublime, the flavors mixed well with each other and the venison was cooked to perfection. I'm quite a picky person when it comes to mash, if there's a lump - you get a lump, but I can't fault this mash. If I were to have two, very, minor complaints it would be that I only found one piece of chestnut and that the rabbit was a tiny bit on the dry side. All in all, this is a very nice restaurant with an excellent kitchen and a very attentive and quick, but unobtrusive, service. I will definitively go back for more, I still have those two dishes left on the menu and the Spring menu could be out any day. I would recommend this to anyone. For all of you out there that thinks that going to Old Orleans or Chili's is a good eating experience, please try this place. You will actually encounter some good food for once. I realise that it is more expensive than any of those places and no, you won't get any crayons to paint on the tablecloth with but you will get other things. Like proper food, made from real ingredients by someone who knows and loves what they do. So, why not save up for one visit - I promise you that you'll realise what you've missed all these years. Mikey's verdict: Two thumbs up! Go there and support a good local restaurant. Now! There should be a review of a hot new restaurant in Reading being posted here at some time during Sunday afternoon. Keeping up with the review theme, expect a book review of Digital Food Photography. Valentines Day - The worst day of the year to eat in a restaurant? I think it is the same all around the world. Almost every restaurant, small as big, offers special 'value' set menus for Valentine's. Get three dishes for £19.95 or something similar. I think that Valentine's is one of the biggest nights for restaurants these days. Judging by what I've seen the last couple of years they do seem to squeeze every last penny out of the poor customers. There can't be any other night on the restaurant calendar where they try to get people in and out of the restaurant in the shortest possible amount of time. It doesn't do much for the romance of the evening when you're told that you got something like 45 minutes to eat. You start your meal knowing that you will be pushed out of the door within a certain amount of time. That way the evening starts on a bit of a downer, and that's even before you've had the chance to sample the food. What normally happens is that they know that 95% of their customers will go for the cut-rate set menus. Knowing this they start preparing these dishes earlier in the day just to save time and effort closer to service. So when your meal is on the table, it will have been sitting in a nearly-ready state for quite some time. We all know how quickly food degenerates when it is sat waiting. I guess you might be getting my point now. They try to push as many people through the restaurant as possible and try to do it with as much profit as possible by quite often using inferior ingredients and preparing everything too far ahead just to save time. A couple of years ago we were sitting down our local and could observe many of our friends heading off for their Valentine's meal. Most of them were heading off to the same restaurant, a Curry restaurant that I rate very highly. It was quite funny because we could time them almost down to the second. They headed off and within 50 minutes they were back in the pub for their post meal drinks. The thing that all of these couples had in common was that they were all unhappy with the quality of their meal. There was a fair few of these couples that had gone there on the recommendation of others. This restaurant managed to lose future customers by trying to push too many people through there and at the same time serving food that was below their normal standards. People who normally would rave about the quality of food there felt very let down during this visit. You know yourself how much you hate it when you recommend something to someone and they don't have a good experience. I don't think that I'd ever book a table for a Valentine's dinner. I'd much rather cook something for me and my better half myself and then maybe go out for drinks afterwards. If that's not an option I'd rather go a week before or after the actual date. But that's just me. I've noticed that quite a few of the Supermarket chains here have special pre-made Valentine's meal. All prepared for you, just chuck it in the oven to add the finishing touch. Then you hide the empty cartons and try to pass it off as your own creation. Talk about cheating. You might as well go for that romantic extra fat, extra large bucket from KFC. This year? No Valentine's for me. Since I got a month until that date I thought I might round up some applications from willing participants. Send me your picture, cv and other vital information. :) Remember, I prefer my steak blue - the rest I leave up to you and your imagination. :) Also, you need to be a woman and you should have been born as a woman too. And please, no mentalists. It would be interesting to read your comments to this. 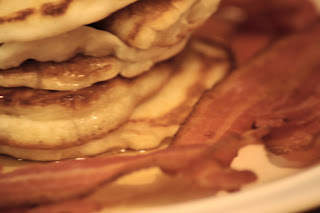 Do you agree or disagree with my view on Valentine's meals? Some of you might have noticed my link to deviantART in the right hand menu. I'll use that gallery to post my non-food photography since I want to keep this blog (almost) exclusively for food related stuff. Feel free to have a look, and maybe comment on some of my photography. You'll find my gallery here. Normally I serve them with blueberries as well as crispy bacon. However, I couldn't find any nice and fresh blueberries that didn't have more miles on them than Paris Hiltons' p***y. So in the name of the environment I decided to go without any blueberries. For once I didn't spend my money on some new kitchen tool or similar. 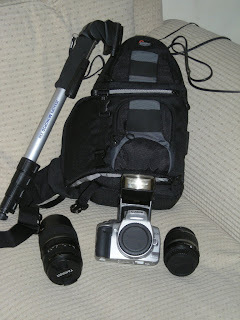 Instead I decided to update my camera. Doing this I hope I'll get some better quality pictures to post here. I've also invested in a book about Digital Food Photography that I hope to review here soon. Due to various reasons I've decided to cancel todays Super Bowl Party. The pork will be used, but the rest won't be cooked. Sorry if I have disappointed anyone. Not much happening. The pork is getting cosier and warmer on the barbie. I've been down the supermarket and done the first shopping run. 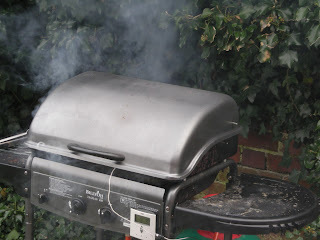 The pork is on the barbie and the smoking/cooking of it has started. No sign of any help from the housemates as of yet. I've finally decided on what to cook for the Super Bowl party on Sunday. I'll post the pictures and recipes during next week.